While our modern day society has made us richer than ever before, many of us seem to feel all the poorer for it. We enjoy more and more free time – steadily moving to a new era of working part-time and freelance jobs – still we’re always on the run and ache for more me-time. We scramble to show off our achievements by Instagramming photos of our spectacular holidays and incredibly talented offspring but inside, we silently suffer from a lack of self-confidence and lower-than-low self-esteem. We are blessed with every sophisticated facility we can possibly imagine, from self-thinking ovens and revolutionary medical treatments to ergonomically designed office chairs and shellac nail rebalancing services… still we experience an inner emptiness that can draw us into the falsely comforting arms of alcohol, sleeping pills or psychoanalytic therapies. Somehow, our Western dream of time-saving convenience has mutated into a time-sabotaging nightmare, like a beautiful butterfly wrongly transforming backwards into a hungry larva. Remember how the miracle of email was going to simplify our lives? Boy, do we know better now. Digital connectedness has grown into a behemoth that wolfs down our precious time and practically enslaves us on an hourly basis. With strained eyes, we helplessly watch an ever-nagging lack of time and purpose starve our sensitive souls and leave us feeling stressed and unfulfilled. 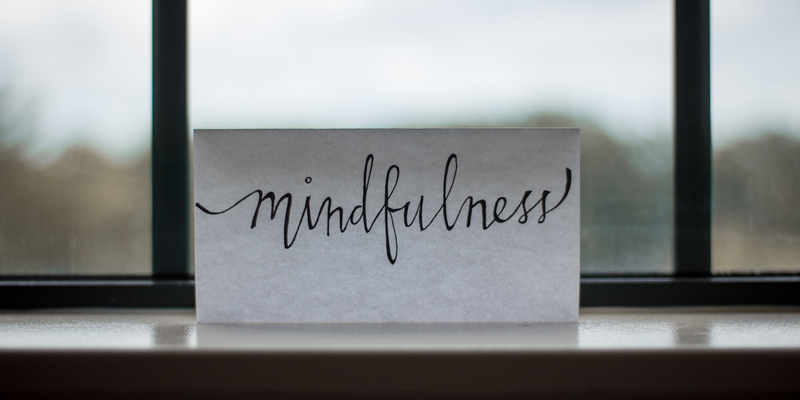 But with an alarming 75 percent of New Zealand’s working population suffering from some level of stress, it’s good to see that mindfulness is quietly but steadily gaining ever more ground. Its Buddhist teachings are opening up our awareness and leading us back to sensible contemplations and inner calm. As an internationally published mindfulness author and an online mindfulness teacher – resetting the overwhelmed minds of my audience through my platform growingmindfulness.com – I’m thrilled to see more and more people starting to embrace the thought-provoking principles of the mindfulness philosophy. If you wonder if life hasn’t more to offer than rushing from one task to another, then try these ten mindfulness principles. They will help you find your true north and experience a deep, emotional shift that will help to change your life for the better. Accepting means acknowledging that things are just the way they are right now. But somehow, we are trying to force others and situations into a shape that is more acceptable to us. Reality, however, can’t be reshaped to suit, and denying or resisting just burns up your energy. You can step out of that stream of judgements by accepting everything that’s going on in your life, right at this very moment. Just allow everything to be what it already is. Acceptance doesn’t mean that you must be passive or give up your ethics. It simply means that you’re actively giving up a useless fight against reality. Without the confusion of prejudice, fear and blame, you will be able to think clearly and see what you need to do in order to change matters. Our minds can chain us to all sorts of thoughts and feelings. We cherish good experiences, but somehow we also like to hang onto bad experiences, like a missed opportunity or a failed marriage… even though thinking about this causes us pain. When you can let go, you liberate yourself from stress and emotional pain. Letting go of good as well as bad experiences allows you to clear your mind of excessive baggage and welcome new experiences. With letting go, you will find emotional calm and more mental space to notice life’s abundance that surrounds you. Our minds tend to label each event, no matter how small or unimportant, as good, bad or neutral. We consider and judge every experience, every feeling, anything someone says or does. We’re not even aware that we are doing it but thoughts come and go all the time, fighting for our attention. They make us feel good, and then bad, and then good again, and so on. No wonder we can often feel emotionally overwhelmed. If you want to unlearn this tiring habit, you can step into the role of an independent party – the researcher within you, who is able to take a close but detached look at your own thoughts and judgements. You don’t have to change these – nor make further judgements on the judgements. Simply accept that your brain produces judgements and don’t get involved in the content of these black-and white thoughts. In our lives, we strive to obtain a certain status, valuable possessions, and the company of desirable or important people. Once we have what we wanted, we need to keep fighting to hold onto it. This constant struggle is exhausting. While striving is longing for something to take place in the future, mindfulness is about sticking to the present moment and not being dominated by future fantasies. What would happen if you would just accept who you are, what you do, who you are with, and just be… here in this moment? Do you think the world would stop turning? We all know it won’t. What will happen is that by practicing non-striving, your mind will relax and you will awake to a new reality. Exciting possibilities that you could not see before will now start to unfold. When you plant a flower bulb, you know you will have to wait for the flower to grow. Stirring up the soil won’t help: it might even damage the bulb. It simply needs time. Just like a baby needs nine months to fully develop before being born. Or a brilliant idea that needs time to crystallize. While we instinctively know that good things need time, we can’t seem to stop ourselves from hurrying and getting things done quickly. And so we’re multitasking and stressing until we crash and burn out. Does rushing really work? Once you’ve worked through your tasks franticly, you’ll only find yet more tasks to complete, right? Try to focus on patience and allowing quality to enter your life. Imagine delivering a beautiful piece of quality work… it will make you feel intensely content and utterly alive. We are habitual animals and love predictability as it makes us feel safe. But this attitude also stifles our energy. Always operating from your comfort zone makes you dull. New people, new things and new events may seem a little scary at first but they also provide a lot of fresh energy. It’s new: you haven’t tasted it yet; it’s there to be discovered. Young children discover new things every day and are happy about it. Old children – that’s you and me – think they’ve seen it all before. No wonder we can find ourselves being cynical and creatively starved. Starting again, discovering life with new insights, creates an open and happy state of mind. There is an endless sea of bright, fresh moments right in front of you. Look at them through the eyes of a young child, leave your judgements and opinions behind, and start all over again. Although we might think we have trust and are trusting, the opposite seems to rule our lives. Just check Facebook and you’ll see how cynical, jealous and controlling people can be. This originates from the fear of being easily fooled. And we don’t want to look like a fool, we want to be seen to be clever and on top of things, ha! But not trusting starves our sensitive hearts. Distrust causes a lot of stress and affects your well-being. Trust, however, is magical because it will change your outlook on life dramatically. People rarely abuse trust because we all know how valuable it is and we don’t take it lightly. So try trust this week: give it to your children, to your partner, to your employees. Trust that they know how to deal with the things they have to do. You’ll be surprised by the effects of non-conditional and genuine trust! Compassion is not sympathy or feeling sorry for someone else, which can be quite humiliating. Compassion is understanding someone else’s behaviour on a deep level, from the wisdom of your heart. With compassion, you’ll stop making short-sighted assumptions and mindless judgements but instead, you’ll turn to your emotional intelligence to feel for someone’s situation… even if this is a person you don’t like. Being compassionate and forgiving doesn’t mean allowing others to hurt your feelings and get away with it, but it does help you to understand someone’s background and motives. Compassion enriches your life, because making an effort of understanding the human condition adds texture and depth to your own inner world. In our hierarchical, status-obsessed society, we are taught who’s boss and who’s not. Being top dog and dominating others is considered a true virtue. But do we see that this belief actually works? The number of people suffering from burn-out are staggering and costs our society billions of dollars in sick leave. What if we were to update our worn-out beliefs and instead give humility a go? If you doubt it would work, just consider the impact of leaders such as Nelson Mandela, Mother Theresa and the Dalai Lama. They never cared about status, and no job has ever been beneath them. Like true leaders, it was clear to them that they were merely instruments to serve humanity. If you think status might get you far, think twice because it’s humility that has a far greater impact on the well-being of others. Have you ever heard yourself promising your elderly neighbour you’ll visit her sometime next week but never got around to it because you had no time? While this seems to be the new normal in our busy-busy-busy society, it is actually pretty damaging to our emotional health. A promise is a promise. You need to stick to it. If not, you’ll undermine the fine fabric of your social network because others will come to know you as untrustworthy and won’t take you seriously anymore. Since we are herd animals, we can’t live without the love and respect of other people. So stop strewing around empty promises only to keep others ‘happy’ in the short run, while making them miserable in the long run. Instead, consider each of your promises carefully, and only make a promise when you know you’ll be able to keep it. This ethic will increase your selfesteem and others will respect you for coolly keeping your word.